Dustin Poirier thinks he's got a good solution for the UFC 230 main event and it involves his fight with Nate Diaz. 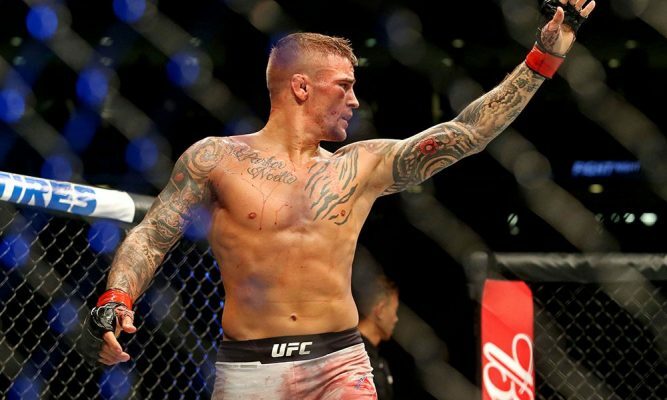 The UFC are apparently still searching for a main event for UFC 230 and it appears that Dustin Poirier has a solution. Speaking last night at the UFC 229 pre-fight press conference, UFC president Dana White confirmed to reporters that former UFC light heavyweight champion Jon Jones will not feature in the headline bout of UFC 230. Jones learned earlier in the week that he will be eligible to fight on Nov. 3 after USADA handed him a 15-month backdated ban after failing a drug UFC 214 fight week. Despite being able to fight, White insisted that it won’t be Jones headlining at Madison Square Garden. “That’s correct,” White said when asked to confirm that Jones isn’t headlining UFC 230. “We will announce it soon. We’re working on a deal now. “We got to get s*** done,” White later added. Following White’s comments, Poirier then took to social media to give his own thoughts on what he thinks could be the headline fight at Madison Square Garden. “What about me and Nate for the 165lbs belt?” Poirier tweeted. With a glaring lack of alternatives, stranger things have happened. The only other bout that could headline the card is a welterweight title fight between champion Tyron Woodley and former interim champion Colby Covington. At present it remains unclear whether Woodley would be able to fight on the card given the injury he suffered to his thumb after fighting Darren Till earlier this month at UFC 228.